The Buffalo Nickel design by James Earle Fraser was a highly acclaimed artistic masterpiece when it debuted in 1913. A few months after entering circulation, it was observed the wording FIVE CENTS, located raised on the rocky mound where the buffalo stood on the reverse, was experiencing premature wear. The Mint responded by placing the buffalo on a flat line, with the recessed denomination below the line, where it was better protected. Numismatists classify the variety with the buffalo on mound as Type 1. The flat line version is called Type 2, and were produced in much smaller numbers than their Type 1 cousins. 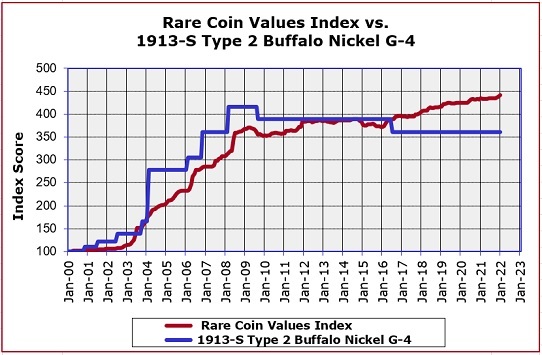 With a mintage of only 1.2 million to start with, there just aren't enough 1913-S Type 2 Buffalo Nickels around to satisfy collector demand today. It is desirable in all grades and always has been and always will be a leading key date in the popular Buffalo Nickel series. The blue line above tracks the percent change since Year 2000 of the 1913-S Type 2 Buffalo Nickel. It outperforms the Rare Coin Values Index, which graphs the overall percent change over the same time period of a representational group of 87 rare US coins. The 1913-S Type 2 Buffalo Nickel is one of the 87 Index coins, The purpose of the Index is to measure the strength and direction of the rare United States coin market. The Index is updated every month.